DEC recently announced $316,767 in funding for three projects to help reduce localized flooding and restore aquatic habitats in tributary streams of the Hudson River Estuary. Funding for these projects is provided by the State's Environmental Protection Fund (EPF) and is administered by DEC’s Hudson River Estuary Program in partnership with the New England Interstate Water Pollution Control Commission (NEIWPCC). 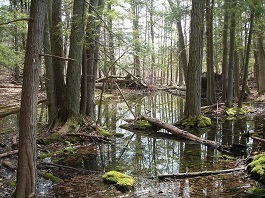 The Rensselaer Plateau Alliance (RPA) received $110,000 to identify flood risks and evaluate natural methods (forests, wetlands and floodplains) and engineered approaches to assist communities in the Poesten Kill watershed to improve their resilience to flooding and protect natural resources. The communities include the Towns of Postenkill, Grafton, and Brunswick, and the City of Troy. Trout Unlimited was awarded $104,967 in partnership with the Towns of Copake and Hillsdale to identify and prioritize road-stream crossing replacement projects in the headwaters of the Roeliff Jansen Kill (Roe Jan). The goal of the project is to reduce habitat fragmentation for American eel, river herring, and trout, as well as improve community flood resiliency. Tighe & Bond was awarded $101,800 to develop a road-stream crossing municipal management plan for the Town of Esopus. In addition to the municipal management plan,Tighe & Bond will produce three conceptual culvert mitigation designs and a 100 percent shovel-ready engineering design.